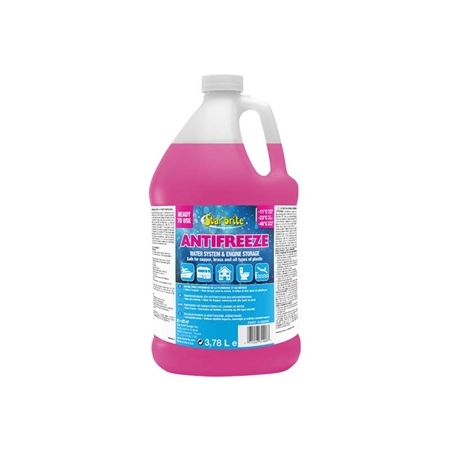 Protects water systems & engines from freeze-ups during storage. Starbrite -50 degrees F (-46 degrees C) Non-Toxic Antifreeze provides excellent cold weather and corrosion protection for drinking water systems and all engines. Its premium additive package prevents corrosion of aluminium, copper, brass and solder, but will not harm rubber, seals or hose materials. The 3X-died bright pink colour provides excellent blow-through visibility. Formulated with virgin, non-toxic USP-grade ingredients. It contains no alcohols. This product is ready-to-use; do not dilute it. Starbrite -50 degrees F (-46 degrees C) Non-Toxic Antifreeze will provide burst protection to -50 degrees F (-46 degrees C) and freeze protection within a range of +12 degrees F to +16 degrees F (-11 degrees C to -9 degrees C). When testing with a refractometer or hydrometer designed for use with propylene glycol, freeze point readings on the PG scale will range from +12 degrees F to +16 degrees F.
Note: The bursting point of PVC pipes used in most drinking water systems is about -10 degrees F (-23 degrees C). When winterizing water systems in regions where temperatures can fall below -10 degrees F (-23 degrees C), we recommend using Starbrite -100 degrees F (-73 degrees C) Non-Toxic Antifreeze.